Congratulations Isabel Stackawitz & Katie Balint! Will-Moor is proud to announce 2 more 2019 State Champions! 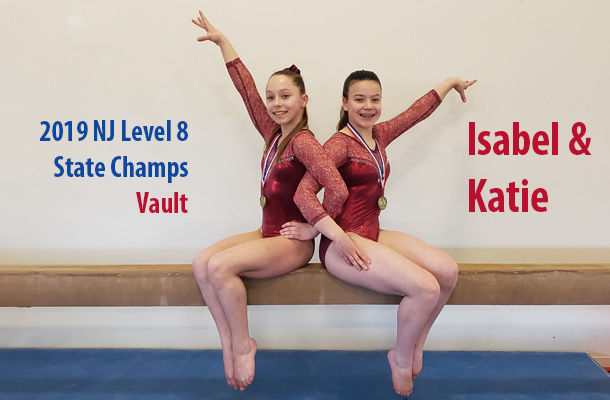 This time we are adding 2 Level 8 Vault Champions, Isabel and Katie each earned a 9.80 making them State Vault Champions in their own age divisions at the NJ State Championships held on March 17, 2019 at Rutgers University. The girls both had strong All Around finishes with Isabel 38.200 placing her 4th AA and Katie with a 37.650 placing her at 2nd AA.